Nixon Motor Sports: September 11th: Give Blood! It's been very sad today to read about an on track fatality last night in New York, so NMS would like to add our condolences to family and friends of the driver killed during a dirt track race last night. We all need to keep safe at all times, on the road and on the track, or anywhere near vehicles. Coming up September 11th will be the annual Red Cross blood drive held at Darlington Raceway. Donating blood is one way to remember 9-11 as a memorable day in our nation's history, and also is a great way to help other people too. Here on the NMS blog, we try to talk about the present and the future so I won't talk about where I was on 9-11, other than to say that like just about everyone else in our country, I'll never forget. On a happier note, for those that donate on September 11th, you can then take YOUR car and drive a few laps on the track behind a pace car. NMS did this last year with the mighty FIAT and had a lot of fun doing it, even if NASCAR doesn't seem to have any Italian cars in their races. 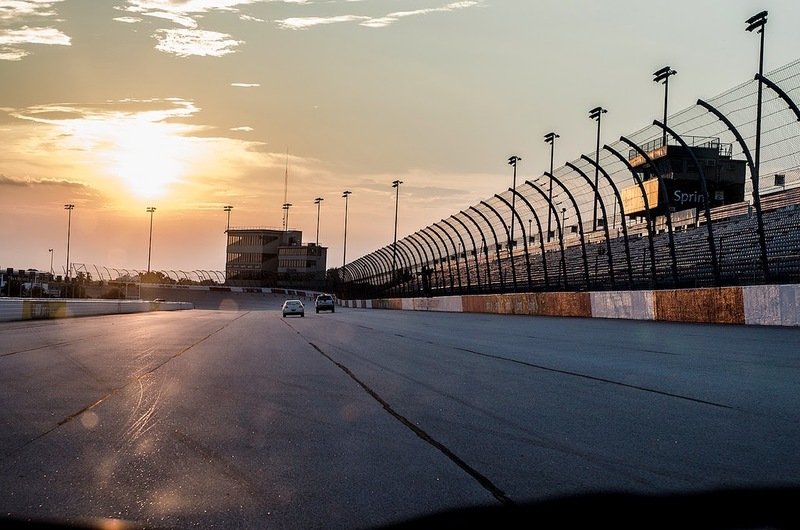 Here's a nice shot as the sun was going down that Brian took on the track while we drove after last year's blood drive.